Britain has lost its number one spot on the world’s ‘soft power’ ranking, ceding its place to the United States. 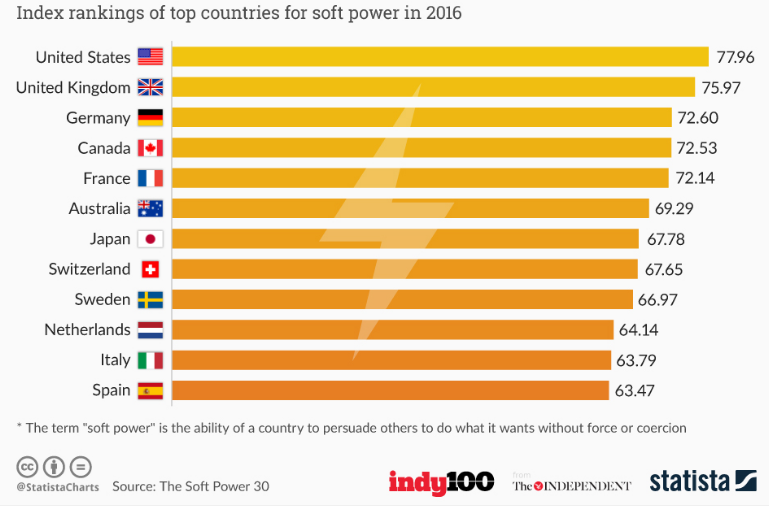 The Soft Power 30 , compiled by Portland Communications, ranks countries in order by the amount of ‘soft power’ they exercise. Soft power, or what President Barack Obama calls “real power” is the ability to persuade others to do what you want, without having to use force or coercion. Soft power uses persuasion – winning hearts and minds rather than wars. The index uses objective metrics of countries’ soft power resources along with subjective international polling data. Britain fell one place to number two in this year’s ranking, while the US moved up to the top spot from third position last year. Other fallers include Germany, France, and Switzerland. Upward movers include Canada and Japan. That said, the same countries fill the top five spots – albeit in a different order. The report’s findings show that soft power capability is rising faster in North America and Asia than in Europe. Indeed, half of European countries have fallen in the rankings. The report cites Europe’s continued economic problems, the refugee crisis, and support for political parties outside the mainstream as having had an impact. In contrast, Asian soft power is on the rise with China, Japan, and Singapore all in higher positions than last year. Part of the rankings methodology relies on objective data – looking at a range of different sources divided into six categories: Enterprise, Culture, Digital, Government, Engagement, and Education. For instance, America’s ranking has been bolstered by President Obama’s efforts to use consensus as a means of exerting influence, rather than hard power. An historic visit to Cuba, the lifting of the decades' old arms embargo on Vietnam, and diplomatic initiatives that resulted in the Iran nuclear deal are all examples of his foreign policy diplomacy. In addition, America’s universities are among the best in the world, as assessed by several global university rankings. The US attracts more international students than any other country. It also has cultural assets such as Hollywood, which influences opinions about the country of billions of people who have never been there. The report does not suggest that the UK’s results have declined, but rather that the US’s have improved. The UK still maintains a strong balance across all elements of soft power, with institutions such as the BBC World Service, the British Council, the British Museum, as well as the UK’s higher education system, all held as pillars of soft power. The UK’s work on the global stage, particularly its contribution towards global good is also mentioned. Major global organizations that contribute to development, disaster relief, and human rights reforms like Oxfam, Save the Children and Amnesty International are key components of Britain’s soft power prowess. Britain’s medal haul in the 2012 Olympic Games is also a boost to its cultural soft power resources, and its record haul from Rio should contribute to its future rankings. However, following Brexit, the report warns, there would likely be a negative impact on global perceptions of Britain. The rankings also use subjective data gleaned from specially commissioned polling across 25 countries, as well as information from Facebook’s data-science team, which looks at the Facebook pages of national leaders and foreign ministries, assessing both followers and levels of engagement. Germany is still widely admired for its advanced-manufacturing goods and engineering prowess, its ‘cool-headed’ approach to foreign policy and an economy that seems to translate growth into well-being better than most, says the report. Canada’s soft power has received a significant boost this year with the election of Prime Minister Justin Trudeau. His social media savvy and general popularity have led to stronger polling results for the country. Japan’s improved rank comes partly on the back of a higher score in the polling and higher scores in Engagement and Culture. The report states that future success will depend more and more on collaborative working. And technology will be a driving force. At no point in history has the global public been better informed, more able to engage, or more keen to participate in public debate and policy-making, says the report. Governments harnessing the power of digital tools have proved most successful in the Soft Power 30. As Professor Joseph Nye, who first coined the phrase "soft power" 26 years ago said, "power with others can be more effective than power over others." What are the limits of China’s soft power? Which type of coercion is best for settling trade disputes?